I’ve been mulling this over for a few months now, and you can read my first post on the subject here. Unfortunately, I don’t have any hard and fast plans — more reading and research = more confusion! In reading comments on some other “biking with babies” type posts, it’s obvious that many people assume that biking is solely for recreation and not transportation. Comments such as, “If you and your husband want to go for a bike ride, leave your baby with a sitter,” reveal general ignorance about using a bicycle for transportation. What if we want to go to an event in the park WITH the baby? What if I need to pick something up at the grocery store? Am I confined to only using my car for these short, easily bikeable trips for the first 12 months unless I leave baby behind? Despite all the naysayers, I’m not giving up yet. First, discard the false (yet commonly held) belief that cycling itself is inherently dangerous. In fact, it’s no more dangerous than driving or riding in a car, yet most people hop in a car every day with little thought to the risk, and no one bats an eye at a pregnant woman driving a car or parents transporting their infant in a motor vehicle. That leaves us with a couple of possible legitimate risks to consider when biking with babies: 1) balance and 2) road vibrations. A child seat attached to the bicycle could destabilize the bike, especially if they raise the center of gravity. However, most accidents here occur not while the bike in motion, but rather while it is stopped. 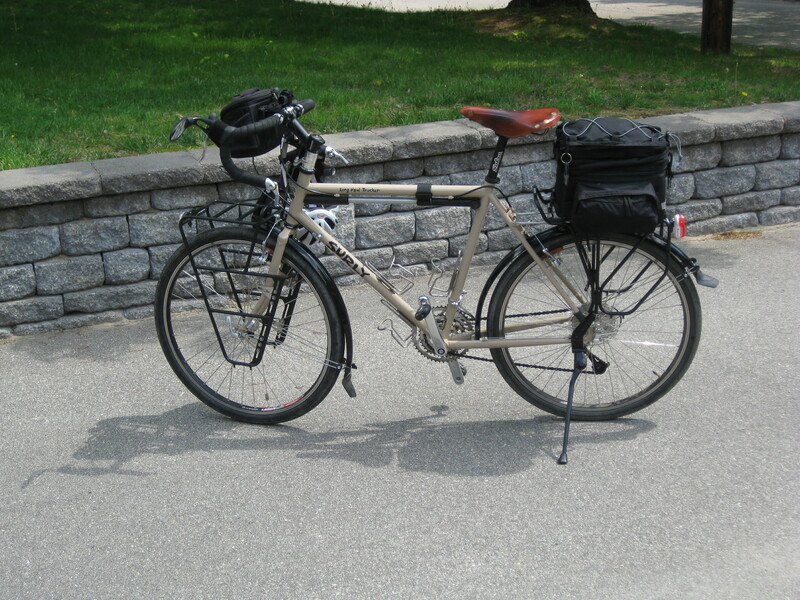 Solution: use care when loading/unloading and get a kickstand that provides more stability, either a double (i.e., pyramid) style or one that mounts closer to the rear of the bicycle. You could also invest in one of the specialty cargo bikes that I mentioned in my last post, or use a trailer. Although there are no studies on the subject, some people claim that riding in a bicycle trailer exposes young babies to levels of road vibration that can cause brain damage similar to shaken baby syndrome. While I certainly don’t want to discount this risk, there is NO EVIDENCE that bicycling with babies in trailers causes brain damage. Solution: Invest in a trailer with a suspension system, keep the trailer tires inflated at a lower pressure to absorb more impact, and secure infant in a car seat so that his/her head is fully supported. Since last writing on the subject, I have talked to two parents who love their Xtracycles for biking with slightly older children, but I am leaning toward a trailer + car seat as the best (and most economical) solution for biking with a young infant. Unfortunately, the nice trailers that have suspension systems (examples here and here) cost significantly more than the run-of-the-mill bike trailer, and, because they’re less common, I imagine finding a used one will be next to impossible. Realistically, I think the earliest we would try this would be around 3 months of age, meaning we have a bit more time to ponder. Ideally, there would be a way that we could try various cargo bikes and bike plus trailer combinations before committing to one, but at some point, we’ll just have to make a decision. This entry was posted in Biking, Green Ideas and tagged bicycles, biking with babies. Bookmark the permalink. I’ve certainly seen photos of women doing this in other parts of the world, and this would be simple and require little extra gear. Since we’ll have to haul whatever we get, be it a trailer or a large cargo bike, up and down our basement stairs every time we ride, something like this does sound extra appealing. Having baby strapped to the parent’s body would reduce the road vibration concern, since the baby would have the bike and mom or dad’s body as shock absorbers while traveling. The main risk would be from a fall, and since info on biking with babies is scarce in general, I doubt there is good information comparing the general safety of this approach as compared to the other options. Anyway, as tempting as the simplicity might be, I think we’ll reserve the baby carrier/sling for walking and hiking. I’ve been car-free with a toddler for a little over a year & now are expecting baby #2. We bought a triobike and he LOVES it! The manufacturers have an infant-seat attachment that I may purchase. I have a triobike that I started riding with my son at 14months. http://www.triobike.com/default.asp?clicked=513 It says suitable for 3-weeks upward and you can specify right or left-side installation. Thoughts? That looks really neat. A bit of an investment, but cheaper, and a lot more fun, than a car! Curious where you live that being car-free with little one(s) works so well . . . .
We found something like this: http://www.ezdoublebicycletrailer.com/weeride-co-pilot-bike-trailer/ on craigslist and the kids just love it!